At long last, the relaunch of Archie starts here! I’ve been hyping this ARCHIE relaunch since it was announced back in mid-December. I do think ARCHIE has a certain classic timelessness about it, but there is a TON of room for them to update the title for a new audience. So, now that it's here, is ARCHIE 2.0 going to live up to the hype? Right up front, I liked that they kept the old “chapter titles.” It may seem like a small thing, but I thought it provided a nice bridge back to classic ARCHIE. The story starts with Archie welcoming the reader to Riverdale. 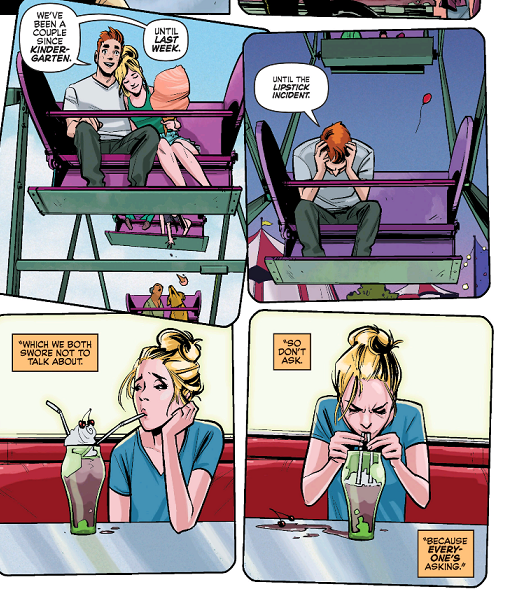 Archie tries to convince us that he’s the least interesting guy in town, but that isn’t stopping everyone else from talking about him and his sudden breakup with Betty Cooper. Archie and Betty had been dating since Kindergarten until “the lipstick incident” (which is never explained to the other students or the reader). The other students are obsessed with finding out why they broke up, and trying to get them back together, even rigging the Homecoming election so they will be king and queen. They try to get Jughead to help, but he seems determined to protect his best friend and burns all the Archie ballots. In the end, Archie is thinking that another girl is just around the corner…as he walks by a Lodge Industries sign. I thought this story was pretty much perfectly laid out. I loved the parallels showing what Archie and Betty’s life was together and apart. It really felt like a perfect image of lost love. There was just a lot of great little moments that showed who the characters were without bashing us over the head with too much exposition. We see the other students desperately trying to get information, by bribing Jughead with food. Reggie swooping in to try and claim Betty as his own. Jughead’s actions to help Archie get over Betty. 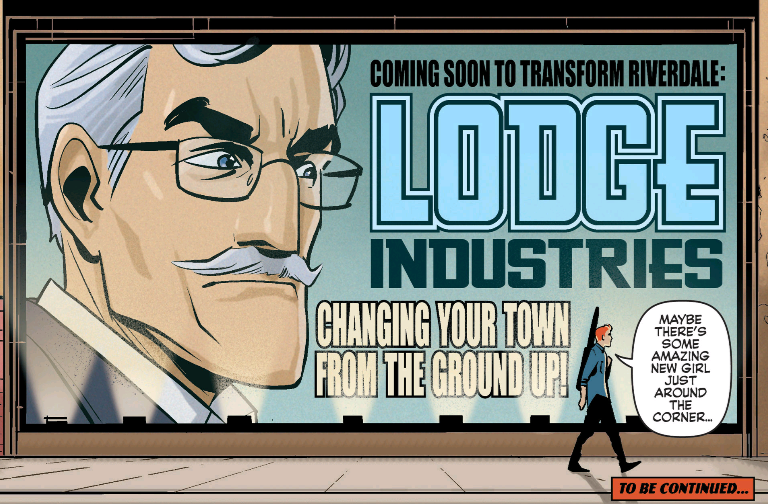 And then the final panel of a billboard of Mr Lodge seeming to glare at Archie. It all just felt really well put together. For some reason, a lot of this comic kept reminding me of SCRUBS. It first came up because Betty looked so much like Sarah Chalke, but there were quite a few little things. I will admit that part of this is probably because I have been binge watching SCRUBS the last few weeks. It’s not a criticism, just something I noticed. The tone of this book was a little more serious than you usually see in an ARCHIE comic, but there were still lots of funny moments, especially revolving around the students’ devastation about the break up. It was also cool to see an ARCHIE story that took place before Veronica came to town shaking things up. It almost gave this issue an origin issue feel. One thing I have always loved about Mark Waid is that he seems to have a ton of respect for comic book history, but isn’t afraid to change things to make them more accessible to a modern reader. Sometimes he falls short (I hated SUPERMAN: BIRTHRIGHT), but more often than not, he does it brilliantly. And I thought it worked really well for this comic. ARCHIE needed a bit of a shakeup…and that is exactly what this was. A BIT of a shakeup. There was just enough of a change to make it feel new…but not too much that it was unrecognizable. Fiona Staples was the perfect choice to draw this. It is a huge departure from what Archie comics usually look like, but it worked great. Instead of being exaggerated and cartoony, the characters all looked much more realistic. But, there was still plenty there to make them all unique and stand out. For me, that is a tricky balance to pull off, and Staples did it brilliantly. No real shock, she has been one of my favorite artists since SAGA #1. Actually, not that I write it, that is the perfect way to describe this new ARCHIE. Waid and Fiona had a tricky balancing act to pull off here, and they both succeeded admirably. This comic could have been a train wreck in lesser hands, but instead, we got a very impressive new series here that I can’t wait to read more of. New Archie has been on my radar from day one..and it definitely looks like it will be staying there. Walked a tight rope between classic Archie and making something new. And did it brilliantly. Waid keeps it new, but still a strong connection to the past. Loved the idea of an "origin story" for the Riverdale gang. Absolutely nothing comes to mind...maybe that there were too many variant covers? But that is par for the course lately in comics. Is it worth your $3.99? YES! ABSOLUTELY! Archie's relaunch is off to a great start! They needed this to be flawless to make this work, and they pulled it off!